If you’re like me, you’ve probably been scratching your head to divine the master plan behind a series of curious diversification plays made by TV, radio and digital audience measurement firm Nielsen over the past several years, including some big acquisitions and strategic partnerships. While it was clear that Nielsen has been hedging against digital disruption that would make its core panel-based TV ratings less relevant, it wasn’t until its national fall client meeting last week that the signal started to become clear. And while I’m not sure that Nielsen has completely figured out how all the pieces integrate, what it revealed to clients last week is tantamount to what the ad-tech and programmatic media-buying community would call a “stack” of technologies that create an “end-to-end” solution. The truth is, Nielsen has several concurrent hedges, so it’s not 100% clear how its ultimate stack will manifest, but you can see one in the flow chart accompanying this column that delineates its new “automated advanced TV buying” stack, which is Nielsen parlance for how it will plug into programmatic TV audience buying. The flowchart illustrates how Nielsen assets plug-in and manifest, end-to-end, with Clypd, a startup that has been developing its own independent solution for advertisers and agencies to plan and buy TV programmatically via a simple, dashboard approach that’s more akin to the world of agency trading desks than pocketpieces. Of course, like any end-to-end programmatic media-buying stack, there are some leaps of black-box faith for what goes in and what comes out of the automation. But the power of Nielsen’s brand name on the data should assuage the skepticism of some critics. After all, Madison Avenue is used to debating the veracity of Nielsen’s data, but ultimately ends up defaulting to the fact that it is, in the end, “Nielsen data." 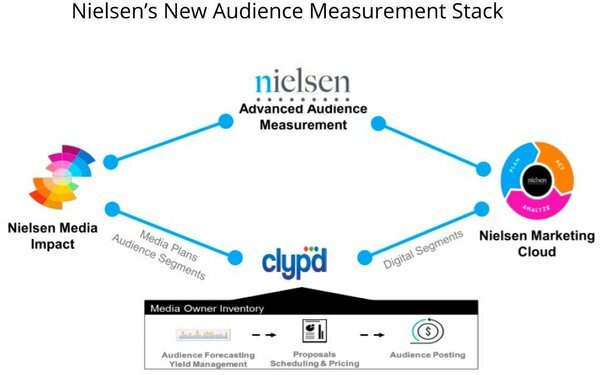 Nielsen didn’t go into great detail about how it had integrated other strategic programmatic assets, including DMP eXelate, but it did give its first public showing of the logic behind its recent acquisition of digital audience attribution and modeling system Visual IQ. 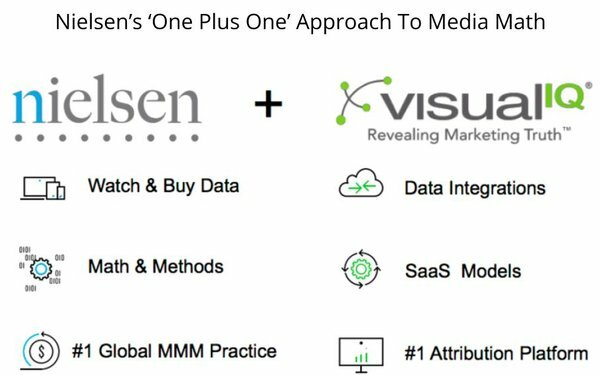 In a section dubbed, “Taking ROI To The Next Level,” Nielsen didn’t reveal exactly how Visual IQ’s product would be integrated, but it at least hinted at the mathematics behind it, in a “one plus one equals” kind of way. (See graphic below.) As they used to say in the TV business, stay tuned. 1 comment about "Nielsen Unveils Its Stack, Wants To Be Your End-To-End Solution". Douglas Ferguson from College of Charleston, October 30, 2017 at 10:39 a.m.
Just as it's very difficult for a legacy media company to shift paradigms, the only legacy measurement company has the same problem. It's hard to clean-slate a business model.